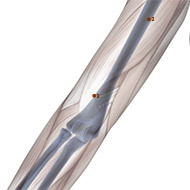 Pericardium Meridian / Channel Acupuncture Points. 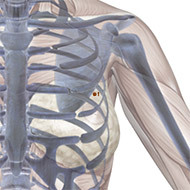 Indications: Suffocating sensation in the chest, pain in the hypochondriac region, swelling and pain of the axillary regIon. Acupuncture Method: Puncture obliquely 0.2-0.4 inch. Deep puncture is not advisable. Vasculature: The thoracoepigastric vein, the branches of the lateral thoracic artery and vein. 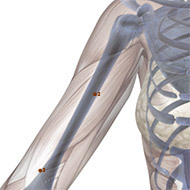 Location: 2 cun below the level of the anterior axillary fold, between the two heads of m. biceps brachii. Indications: Cardiac pain, distension of the hypochondriac region, cough, pain in the chest, back and the medial aspect of the arm. Vasculature: The muscular branches of the brachial artery and vein. Innervation: The medial brachial cutaneous nerve and the musculocutaneous nerve. Indications: Cardiac pain, palpitation, febrile diseases, irritability, stomachache, vomiting, pain in the elbow and arm, tremor of the hand and arm. 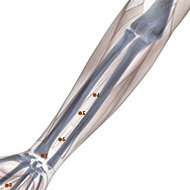 Acupuncture Method: Puncture perpendicularly 0.5-0.7 inch, or prick with a three-edged needle to cause bleeding. Moxibustion is applicable. Vasculature: On the pathway of the brachial artery and vein. 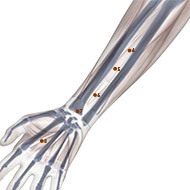 Location: 5 cun above the transverse crease of the wrist, on the line connecting Quze (PC-3) and Daling (PC-7), between the tendons of m. palmaris longus and m. flexor carpi radialis. Indications: Cardiac pain, palpitation, epistaxis, hematemesis, haemoptysis chest pain, furuncle, epilepsy. Vasculature: The median artery and vein; deeper, the anterior interosseous artery and vein. Innervation: The medial antebrachial cutaneous nerve; deeper, the median nerve; deepest, the anterior interosseous nerve. Location: 3 cun above the transverse crease of the wrist, between the tendons of m. palmaris longus and m. flexor carpi radialis. Indications: Cardiac pain, palpitation, stomachache, vomiting, febrile diseases, irritability, malaria, mental disorders, epilepsy, swelling of the axilla, contracture of the elbow and arm. Innervation: The medial and lateral antebrachial cutaneous nerves, the palmar cutaneous branch of the median nerve; deeper, the anterior interosseous nerve. 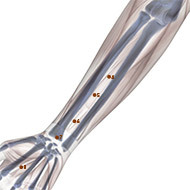 Location: 2 cun above the transverse crease of the wrist, between the tendons of m. palmaris longus and m. flexor radialis. Indications: Cardiac pain, palpitation, stuffy chest, pain in the hypochondriac region, stomachache, nausea, vomiting, hiccup, mental disorders epilepsy, insomnia, febrile diseases, irritability, malaria, contracture and pain of the elbow and arm. Regional anatomy: See Jianshi (PC-5). Location: In the middle of the transverse crease of the wrist, between the tendons of m. palmaris longus and m. flexor carpi radialis. Indications: Cardiac pain, palpitation, stomachache, vomiting, mental disorders, epilepsy, stuffy chest, pain in the hypochondriac region, convulsion, insomnia, irritability, foul breath. 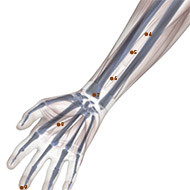 Vasculature: The palmar arterial and venous network of the wrist. 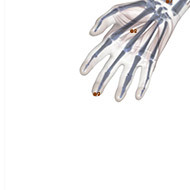 Innervation: Deeper, the median nerve. Location: At the center of the palm, between the 2nd and 3rd metacarpal bones, but close to the latter, and in the part touching the tip of the middle finger when a fist is made. Indications: Cardiac pain, mental disorder, epilepsy, gastritis, foul breath, fungus infection of the hand and foot, vomiting, nausea. Vasculature: The Common palmar digital artery. Innervation: The second common palmar digital nerve of the median nerve. Location: In the centre of the tip of the middle finger. Indications: Cardiac pain, palpitation, loss of consciousness, aphasia with stiffness and swelling of the tongue, febrile diseases, heat stroke, convulsion, feverish sensation in the palm. Acupuncture Method: Puncture superficially 0.1 inch or prick with a three-edged needle to cause bleeding. Moxibustion is applicable. 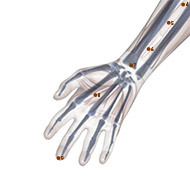 Innervation: The palmar digital proprial nerve of the median nerve.